Those Greeks always have to be different! Not only are they full of wacky stories with guys named Zeus who throw lightening bolts, but once again, they have outdone themselves, but this time instead of mythology, it's yogurt. Erase almost everything you currently know about yogurt, because Greek yogurt, is yogurt on steroids. It's uber thick, extremely creamy AND with only 120 calories and 20 grams of protein per cup, its starting to sound like another one of their wacky stories. Top it with a little honey and cinnamon and BAM, Zeus just hit your taste buds with one of his lightening bolts. YUM! Call me skinny, but I think it was Fage Greek Yogurt that made Zeus the ruler of the sky. I guarantee that the Greeks did NOT invent the processed non-fat version. We can blame that on ourselves in the USA. 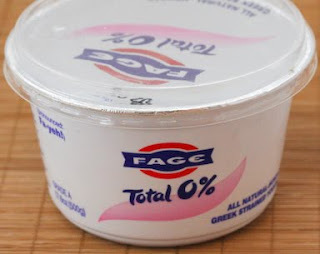 Our Trader Joes now carries only the 2% and 0% versions of Fage. Dang it! hahahahaa, thanks for the detailed illustration convincing me to go shopping at my local trader joe's this morning.